What is Jennifer up to? 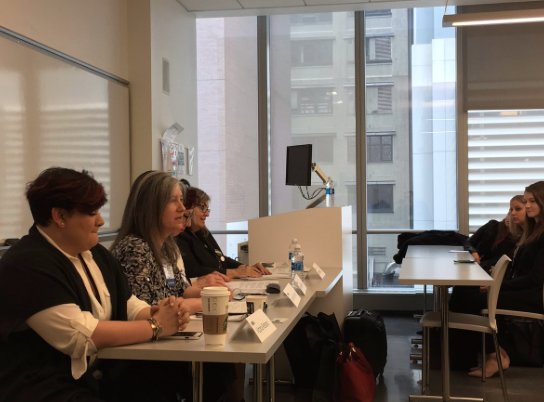 (Second from left) I debated whether journalists should also be activists. Monitoring freedom of the press on "World Press Freedom Day"
I am the founder and editor of the award-winning publication, The Transparency Report, which covers issues related to freedom of the press, speech and expression. Also, I am the host of the podcast, "The Whatcom Wordsmith," on KMRE 102.3FM in Bellingham. Find it here to listen to interviews with book authors and writers. Beginning my career in 1991, I have worked as a full-time reporter and stringer for mainstream media outlets including CNN, Gannett, McClatchy and the New York Post. I started in newsradio working as a reporter for stations in upstate New York (WGY-Schenectady; WRWD-Highland; WPTR-Newburgh; WVOS-Liberty). In those early days, I received excellent training and guidance when I did a stint at the Associated Press, Albany, NY bureau (thank you Mike Hendricks and Lew Wheaton). 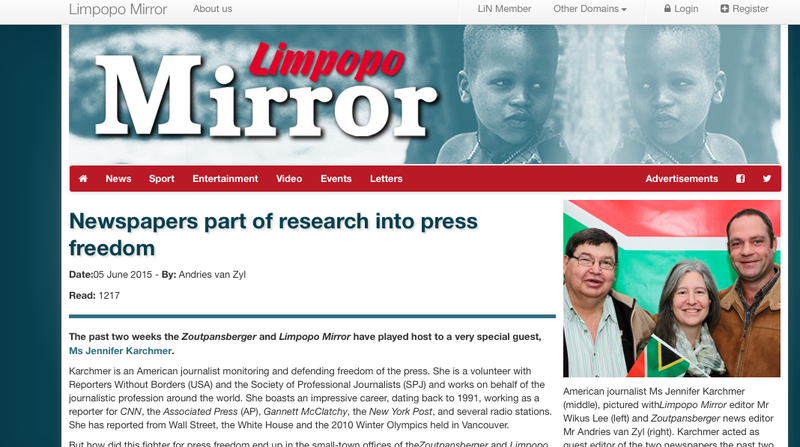 Now, I focus my efforts on supporting and writing for independent media. To learn about my philosophies and attitude toward journalism and newsgathering, you can read my editorials. 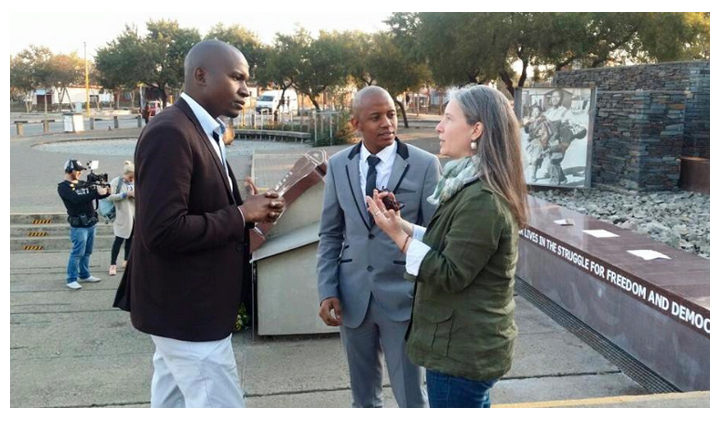 In 2015, I spent three weeks in South Africa as a guest editor at two local newspapers. 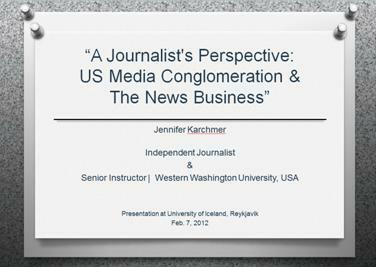 This work goes along with my studies in 2012 in Iceland where I researched freedom of the press. Also in 2015, I took a self-designed sabbatical to study French in Montpellier, France. As a student at the University of Montpellier 3-Paul Valery, I began at level A2 (beginner) and improved to level B2 (intermediate). While in France, I earned my TEFL (Teaching English as a Foreign Language) degree and work as an internationally accredited English teacher. I am a graduate of the Ithaca College (NY) Roy H. Park School of Communications and have completed the Washington Semester Program for Journalism at American University in Wash, DC. I earned my master's degree in communication from Plattsburgh (NY) State University. When not on journalism assignment, I share my experiences and expertise with students and speak up regarding press freedom. I serve as a mentor and coach to up-and-coming journalists and encourage students to choose journalism as a major in college. 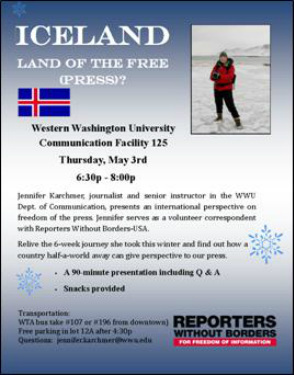 From 2006-2014, I served as an instructor at Western Washington University (Bellingham, Wash.) teaching communication and journalism. Another passion I have is hockey. I have written about a beginner's perspective on women's hockey and putting on skates later in life. I welcome hearing from fellow journalists, students and others interested in journalism and the state of the news industry today. I enjoy speaking to student and community audiences so please go to my speaking page for more information on my travel schedule and feel free to contact me to get a dialogue going regarding a visit to your region, university or community. 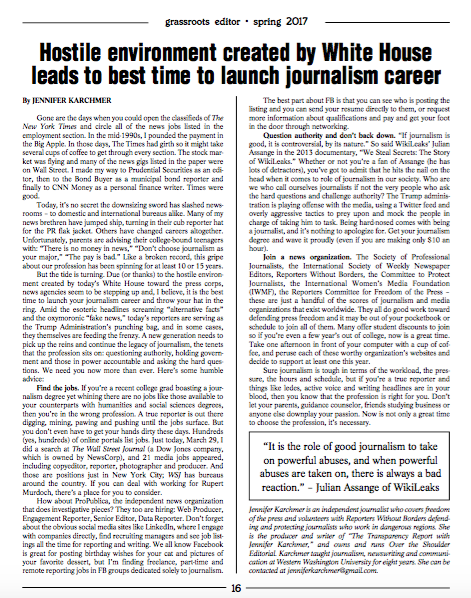 My article (at left) was recognized with the SPJ First Place for Arts Reporting & Criticism News & Features (Non-Daily Newspapers): "Take a Look at Iceland: Internet Freedom During Election Season"
The contest honors the best in journalism in SPJ’s Region 10, which includes Alaska, Idaho, Montana, Oregon and Washington. From the judge: "A very well put together comparison and analysis of the ever-evolving use of social media and the internet to access, explore,amplify, and refute information. Jennifer Karchmer does an excellent job putting various views of internet freedom under the microscope. This piece gives the reader a well researched perspective and where we were, where we are, and where we might be going." 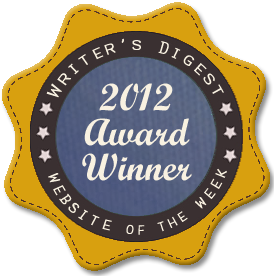 "Writing Website of the Week"
Share book reviews and ratings with Independent Journalist, and even join a book club on Goodreads. Website last updated March 09, 2019. Click here to contact the webmaster.